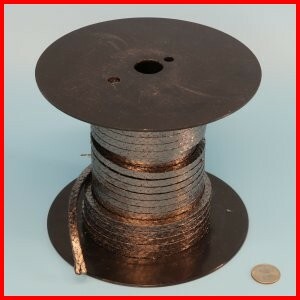 Used as a compression packing for pump and valve shafts and as a stuffing box packing. Made from flexible graphite yarn composed of exfoliated high purity crystalline mineral graphite (flake graphite). Useable to 900°F / 482°C in normal air atmosphere; 1800°F / 982°C in steam or mild oxidization atmospheres/media and 5400°F / 2982°C in non-oxidizing atmospheres/media.